The deviation of this past cruise, while maybe not ideal for some, was very exciting for me. Partly because I’ve fallen madly in love with England and was so excited to see another part of it, and party because of the Beatles. The Beatles were a favorite band of my parents, particularly my fathers, and therefore I grew up listening to their music. For me, the Beatles make me think of home and love and family and warmth and just plain old good music. 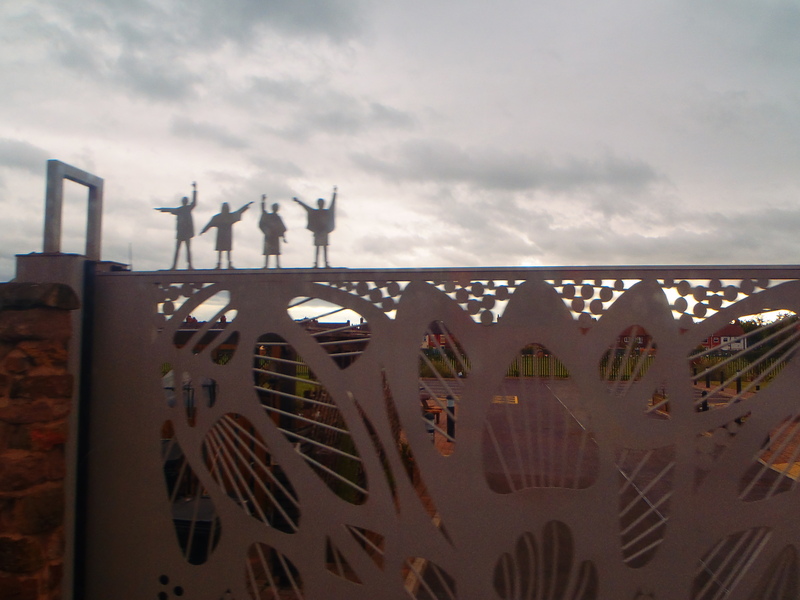 Of course, on a grander scale, the Beatles are a massive part of pop culture and the landscape of music, which means all their favorite places and influences in their hometown of Liverpool are very much commercialized. Random sidebar, when I was last in Amsterdam, we saw the hotel where John and Yoko famously hid out in for a crazy amount of time. During this cruise, my darling friend Andrea from Hungary whom I worked with on the Liberty has joined the team and so off we went to see as much as we could possibly see in Liverpool. Starting off on the HoHo we toured the city and planned where we wanted to stop and spend more time. 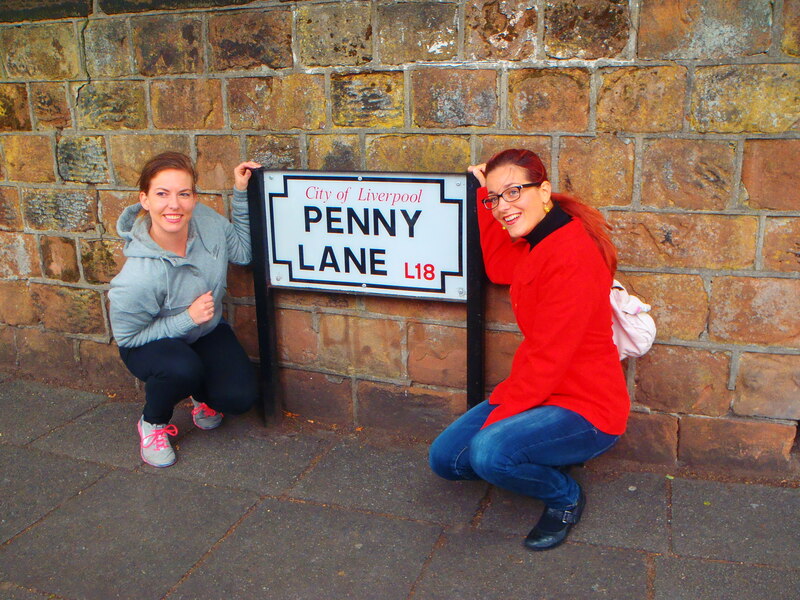 Next we took the 2 hour ‘Magical Mystery Tour’ in an amazing bus to all of the important Beatles places. 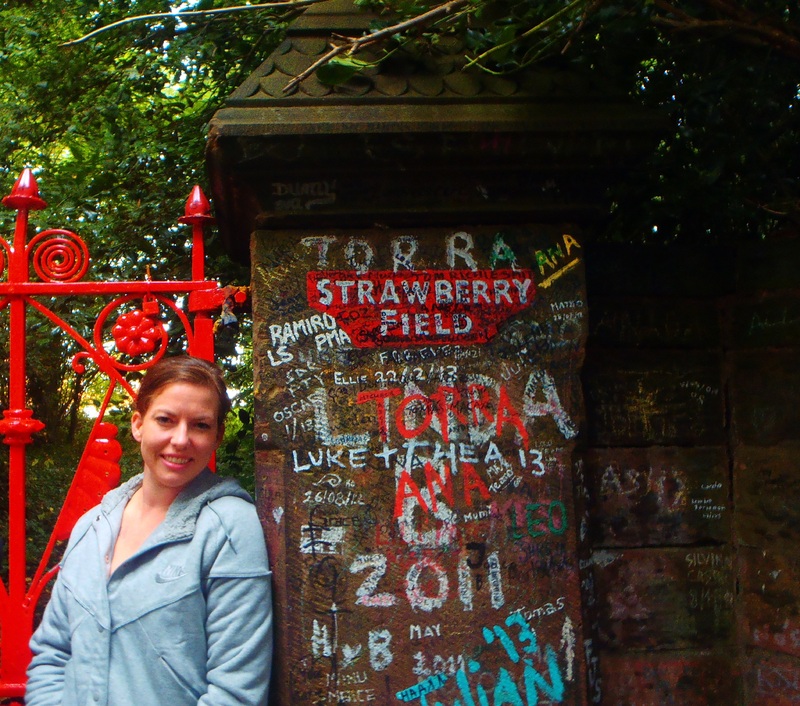 We saw their childhood homes, their schools, Penny Lane, Strawberry Fields, and so on. I really enjoyed hearing all the tour guide’s stories about the musicians and their childhood. The bus played Beatles tunes the whole way and we sang along of course!! After the Beatles tour we got some lunch at Tesco (a store I will really miss when we get back to North America, by the way) and made our way down to the Cavern Club, where the Beatles played a total of 292 times (and many, many other musical geniuses as well). Inside we enjoyed the acoustic music of several fabulous musicians (of course some Beatles songs!!) and gazed at the music memorabilia all over. Being a very big fan of live music, I could have stayed forever, but alas, not possible and we got back on the HoHo to stop at the other places we had wanted to see. Specifically, the Anglican Church, the largest in England, and a beautiful building with very loud bells!! A short souvenir stop ended our Liverpool day and we hurried back to the ship, trying to beat the sudden display of cold treacherous English weather. I could have stayed a lifetime, England I love you and your people (and their accents)!! First of all, let me apologize for being such an absentee lately, with the bad weather and a lot of extra work, I haven’t been able to get much posting done. However, I do have a lot to say, I’m just trying to get it out there!! Here’s something I’ve been working on for a while, I’ve had it sitting in my ‘blog’ document file for a while and just haven’t been able to finish and post it. Oh, I also jsut wanted to say to the other amazing bloggers out there who have followed me lately, I’m very very sorry that I haven’t had a chance to check out your blogs as well, my internet on board is very very limited and most of the time I just get on long enough to post what I’ve written beforehand. As soon as I’m in a port for a few hours I promise to pay more attention to the rest of the world!! Thanks for your patience and for following my adventures!!! Guest Services is such an interesting place to work. We are, in essence, the hub of activity on the ship, like the nerve center of the brain. We are where everyone goes for problems/questions/complaints/compliments/lost items/found items/crying fits and pretty much anything else you can think of. As you can imagine, it gets pretty hectic. There are some other departments that we rely very heavily on to get our job done quickly and efficiently. Issues come to us and we call other departments to get the work done. Specifically, housekeeping. In any hotel the front desk and housekeeping work very closely, but it’s even more so on a ship. The way ship housekeeping works is that we have cabin stewards who do the cleaning of the cabins, turndown service, etc. Then there are the floor supervisors who have sections of decks that they are responsible for, they each supervise a certain number of cabin stewards/cabins. Then there are the housekeeping manager and assistant manager who are in charge of everybody! So in any given day, many different things can go wrong or be perceived to have gone wrong on a ship. Guests call us at Guest Services, we call the appropriate department. Nine times out of ten, we call housekeeping. We have a neat excel document where we can input the cabin number that’s having an issue and the spreadsheet gives us the cabin steward’s phone number and the floor supervisor’s phone number (they all carry cell phones) and we call whomever is on duty at the time. Sometimes we have to call what feels like a million times in a shift, sometimes not at all. Either way, the moral of the story is that housekeeping and guest services are best friends. There’s a certain time of evening when only one floor supervisor is on duty, so ALL the other cell phones get forwarded to that person. Often I’ll end up calling that supervisor a dozen times in one shift to assist me with various tasks such as checking temperatures in rooms, opening safes, pulling out trundle beds, changing remote control batteries or any one of a hundred different requests. The floor supervisors and housekeeping crew work SO hard everyday and I couldn’t do my job without them! Obviously this kind of symbiosis is present in all kinds of other work places. Somehow we feel more connected here than I ever have in any other hotel or resort. Partially I think it’s because we not only work together, but live, sleep, eat, and play together. Although this is also true for resorts where the staff live on property, when you are on land, you can go places, you can get off property. On board, the longest you can leave the ship is for a few hours at a time. It creates a very different dynamic, and I’m pretty sure I adore it!